Clip Friday continues and this time around we’ve got a preview of tonight’s season finale of Merlin as well as another preview for next week’s season premiere of Warehouse 13. Both of these shows are, of course, on Syfy. First up on Merlin the friendship between Arthur and Merlin – as well as the strength of Camelot itself – is put to the test as they search for a way to stop a vicious attack by the Great Dragon in “The Last Dragonlord.” Next up on Warehouse 13 it’s a conversation with series co-star Allison Scagliotti as she explains her wardrobe style on the show. As a fan of the show, not something you want to miss. Enjoy both clips after the jump. The season finale of Merlin airs tonight at 10/9C and Warehouse 13 premieres on Tuesday, July 6th at 9/8C on Syfy. It’s Friday so that means previews of tonight’s shows on Syfy. This week, however, we’ve only got a preview of tonight’s Merlin to share with you. But don’t worry, this episode of the show has enough going on so we don’t really need anything else. In the preview for tonight’s episode, called “The Fires of Idirsholas,” Merlin’s loyalty is pushed to the limit by Morgause’s plan for revenge. What will Merlin do and how will he manage to keep his word yet prevent an even bigger disaster from happening? Tune in tonight to find out. Before that, check out the preview for tonight’s episode after the jump. Merlin airs on Syfy at 10/9C. As we’ve been doing for the past weeks with Stargate Universe and Merlin, we’ve got new show promos to share with you again today. However, with Stargate Universe having its season finale last week, the focus now shifts to the upcoming premiere of Syfy’s Warehouse 13. So, to start us off right we’ve got two clips from Warehouse 13 to share with you as well as a clip from tonight’s episode of Merlin. Fist up on Warehouse 13 check out the team coming back with a vengeance after last season’s cliffhanger ending. How have things changed and what will the team do to make sure those pesky artifacts don’t fall into the wrong hands? Check out those promos to find out. 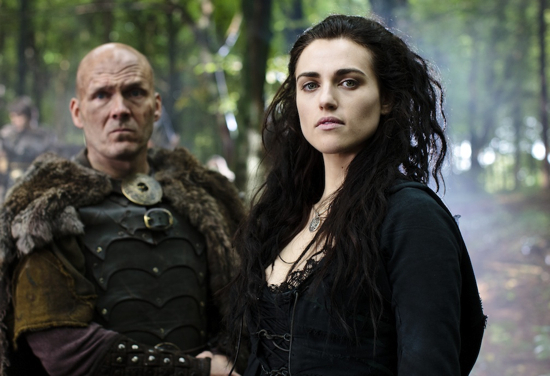 On Merlin, the boy wizard sees a new side to Morgana when Mordred returns seeking her help. Will this turn out to be a good thing or yet another sign that Merlin may have some trouble on his hands? Check out the video and tonight’s episode for all the answers. Check out all the clips after the jump. Merlin airs tonight at 10/9C on Syfy. Warehouse 13 premieres on Tuesday, July 6th at 9/8C.